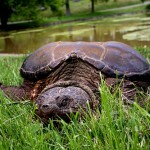 Enormous snapping turtles lurk in Brooklyn lakes but emerge this time of year to lay eggs. Oddly, NY state is about to allow trapping, hooking and clubbing them to death. The coywolf, groundhog and black squirrel we’ve been following have all done pretty well in the last week. CoywolfThe coyote captured in SoHo last week (and probably the same one that’s been lurking around Central Park this winter) got released in Van Cortlandt Park in the Bronx, where a pack already lives, the city’s pre-eminent wildlife rehabber Bobby Horvath says. This young female may have been part of that pack, but was pushed out in mating season. Three coyotes were spotted up at Columbia University this winter. One was hit by a car on 130th Street and another may still be out there. Groundhog The groundhog that turned up on the street near the Soho Grand is doing fine, awaiting release into Van Cortlandt Park in the Bronx. 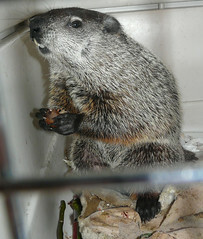 No one is sure how the woodchuck turned up there, but the staff caught him and gave him a dog crate. Bill–as I call him, though he may well be female–turns out to be quite healthy. He enjoys apples, chestnuts and acorns, but shuns the greens he is supposed to like. Bill lunges at the cage bars when I hang around too much–proving that he’s quite healthy and most likely not a misbegotten pet.